I am back again with this weeks #HolidayDetox. I teamed up with Sophia from NY FoodGasm to talk about having a healthy dinner that satisfies. I’ll be honest, this one is a little tough for me, since I have a meats and potato man at home. If you’re a frequent reader you already know how difficult dinner can be in my house. My Husband won’t touch anything too healthy, but every once in a while he can surprise me and of course I share that with you. I have learned over the years to make two meals out of one meal, just to make me and my Husband happy. Just like the post of Man vs Woman Cheesesteak Style. 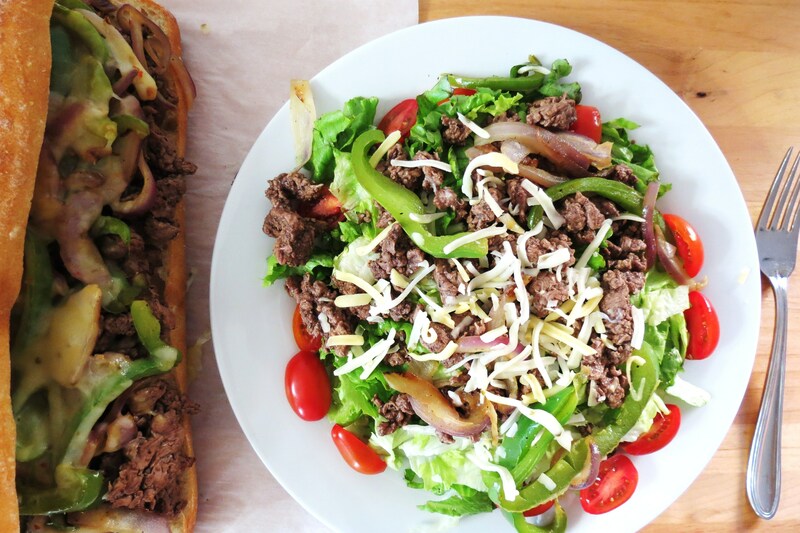 I made my Husband a Cheesesteak Sandwich and I made a salad for me. This dinner was a win win for both of us. But it doesn’t always work out that way, it takes some thought when I prepare my meals. But I think I am getting away from the subject, how do you prepare an easy, quick, healthy dinner that will satisfy your taste buds? It’s actually not too difficult. You need four components to your meal; protein, carbs, vegetables and fat. If you have all of these four things you will have a healthy dinner with lots of flavor. For protein, you should have a 3oz serving size of meat, such as lean ground beef, sirloin, boneless chicken breasts, shrimp, pork tenderloin, turkey, fish like salmon or tilapia, tofu or 1 egg & two egg whites. You can really add some zip to all of these items, like adding an olive oil herb marinade, fresh or dried herbs, balsamic dressing, a pinch of hot sauce or even salsa. The skies the limit. Another key component is a carb, oh how I love carbs, but they don’t love me. Why don’t they love me? Because I can probably eat my weight in bread. So what carbs are healthy carbs? 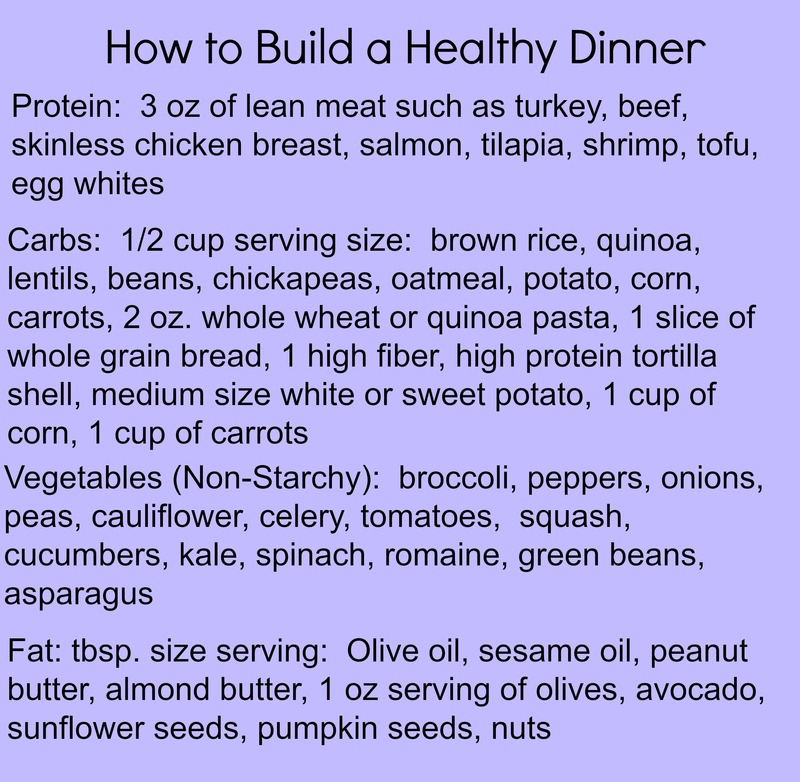 A healthy carb would be considered a half a cup of one of the following; brown rice, quinoa, beans, lentils, oatmeal or 1 slice of whole grain bread, 1 high fiber tortilla shell. Some vegetables fall into the healthy carb category such as; a medium sweet or white potato, 1 cup of corn and 1 cup of carrots. We can’t forget vegetables! In my honest opinion, I don’t think you can have to many vegetables. Half of your dinner plate should be filled with vegetables. You should pick, nice fresh, colorful vegetables to make your plate sing. But don’t forget frozen vegetables are good too. Just check the label and make sure there are no preservatives or sodium added. Yes they add sodium for some reason?? Anyway, you want to fill your plate with vegetables that are non-starchy like tomatoes, broccoli, cauliflower, squash, zucchini, onions, peppers, radishes, spinach and other kind of lettuces. What about Fat? Fat really makes your dinner flavorful and creamy and I use it in just about every dinner I make. The key thing is picking out the right fat. You want to use things like olive oil, avocados, lite cheese and nut butters. Stay away from items that have trans fat and are high in saturated fat like mayonnaise, full fat cream based salad dressings, butter, lard, shortening, fried foods, stick margarine, chicken skin and high fat meats like ribeye and ny strip steak. I know a lot of those things are so good, but you must limit it, they aren’t good for you. Remember they are not heart happy! So how do you put this all together? Easy, take one item from each group and make a wonderful meal. You could have something like pork tenderloin season in olive oil and rosemary with a baked potatoe and a side of steamed vegetables. Or how about grilled chicken kabobs, with pineapple, peppers and onions dipped in peanut sauce? Or lightened up meatloaf with a side of vegetables and a piece of whole grain bread. The possibilities are endless and you can check out my recipe page to get ideas if you like. I pretty much incorporate all of those things into my meals. When growing up that is how my Mom made dinner every night. We had meat, potatoes and vegetables or a side salad and still to this day that’s pretty much how I eat. What about quick meals, like frozen ones or soup in a can? Well, I don’t normally buy frozen meals or soup to often, but I always keep a tiny stash on hand, just in case. I understand that life is busy and we don’t always have time to make dinner, or you just don’t feel like it. So don’t pick up a bag of chips and eat that. Here are my personal recommendations that I follow when I buying pre-made meals. I also made a little chart for you to make it simple when making your dinner. I find this very handy and when you don’t know what to make, just grab an item from each category and I bet you can throw together a wonderful quick dinner in no time! One last thing, here is a list of the recipes in the pictures above with the links. You can also click the pictures and it will take you to that page. P.S. One last thing, I am not a nutritionist or dietitian, everything I share with you is from experience and are my own opinion. Don’t forget to check out Sophia at NY FoodGasm. I posted some recipes below my Black Beans and Butternut Squash Tacos.